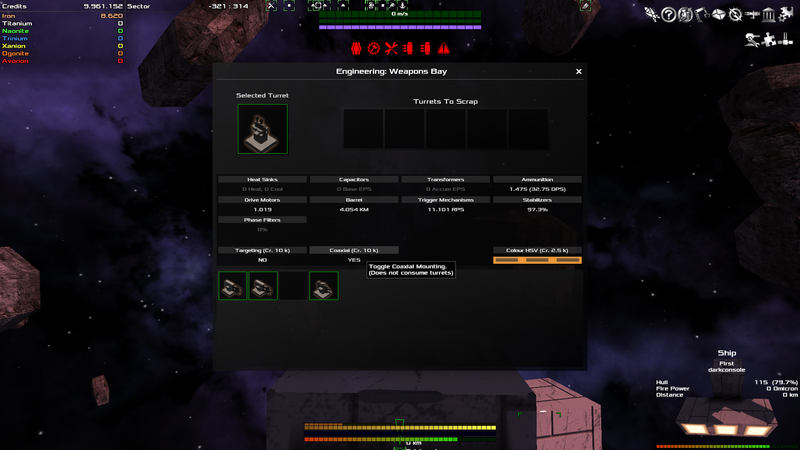 "I am porting the #avorion turret generator from c++ to lua to expose it to modders." 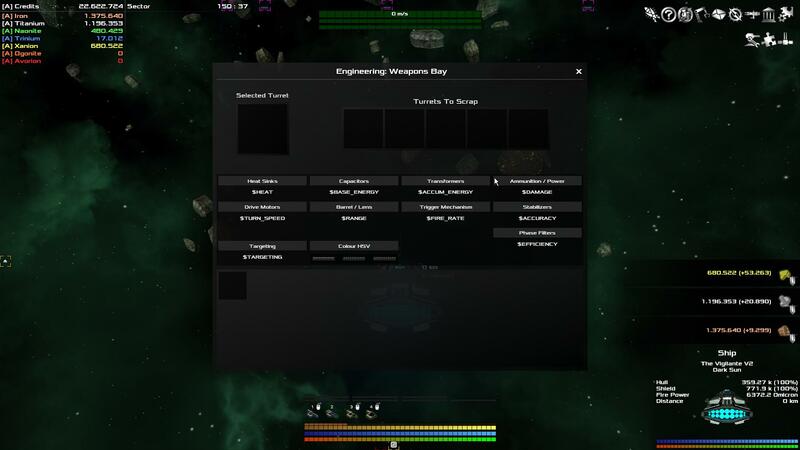 So we'll be getting all sorts of turret-related mods, now. Sweet! Ooooh that's awesome news. Thanks for the share! Yaaay ! A very big step closer to the turrets of our dreams ! Nothing shows up for my buddy and I on our server. You and I are in the same boat! I downloaded the fix and followed the instructions and it looks the same as yours. Did you manage to find the fix for this?? Was working some time ago for me i changed nothing at all simply made a fresh install of the game (and not removing the mod directory) but it's the same as you now and it's like this for more than a week. I think something in the recent updates broke the mod. i heard you guys liked the turret editor. updated against the beta branch 0.20.4 but should be fine on any version that depended on the new callable stuff. here is a test version before i update the main mod page. install exactly as before. its attached to this post directly below here, if you are logged in. Work perfectly again for me. how about a coaxial toggle with its own server side cost setting. Darkconsole, Why you don't add a filter for the weapon list? +1 for awesome factor on this mod. Is the coax toggle supposed to add stats? 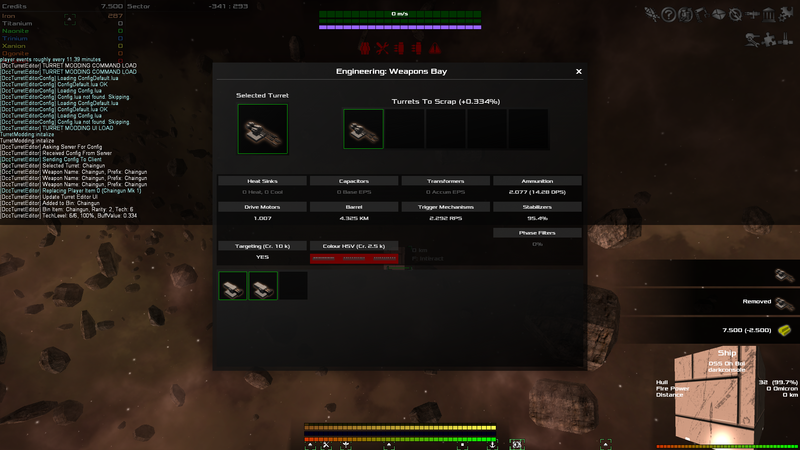 I tried using it on a mining laser and the damage didn't change. i've never even see a coaxial turret drop before. are they more powerful than ones that cant move? literally all this does is toggle that turret type flag. i just saw that it was a thing i can hack and hacked it. im assuming if the game didn't change the damage based on the flag being toggled then they aren't suppose to be any stronger than normal. Doing some research though can't test in my current save yet, having coaxial on a max size weapon is supposed to give it stat boosts. Would explain why I don't see a difference with my small weapons.